Solar heating, solar cells, solar power systems, photovoltaics, and most solar electricity producing applications deserve their time in the sun by going public and listing on the Frankfurt Stock Exchange. Most financing firms offering equity lines of credit, standby letters of credit, financing, and venture capital want the firms to list on exchange first. The difference between the OTCBB and Pinksheet markets which are not exchanges, and the Frankfurt Stock Exchange, is that Frankfurt is a recognized Stock Exchange, as part of the Deutsche Borse Group, it is the 3rd largest stock exchange group in the world. Solar energy advantages to listing on the Frankfurt stock exchange is the green index of companies that the Frankfurt market caters to who would seek investment into viable projects and energy farms that one can build within a clean energy company. Solar energy within India, South Africa, Sub-Saharan Africa, Chile, Peru, Argentina, solar energy Australia, to name a few, have all been met with promising financing terms for solar energy projects on the Frankfurt Stock Exchange. In general, wherever there is a viable project with a solar energy source, financing is available for solar power projects. Energy economics are simple, if the price of energy is high and there is a shortage within the Country the power plant is being developed within, the alternative power sources will be profitable and economical. In simple terms, this project can get financing on the Frankfurt Stock Exchange. Frankfurt is the solar energy home of financing and listings of publicly traded solar energy companies. Solar energy companies need to seize the opportunity and list with FSE Listings Inc, the leader in listing green renewable energy companies on the Frankfurt Stock Exchange. Renewable energy solar power plants, solar renewable energy companies in general, manufacturers, and distributors have the opportunity now to become leaders in the solar field, and become electricity providers in the now level field within the energy crisis. Were the solar energy costs are economical, profits are to be made by shareholders and financiers, then listing on the Frankfurt is a great quick option. A listing can take 3-6 weeks for the right project, contact us to see if you qualify. You know how solar energy works, we know how the Frankfurt Stock Exchange works, let’s put both our expertise together and make your business a success. Solar financing is easy if you know how to structure your company. To meet the requirements of solar energy finance, companies need to be within the solar energy technology industry, solar energy and solar installations, solar energy equipment, solar energy manufacturing, solar energy power systems, solar energy solutions, solar energy storage, solar energy financing, solar energy power plants, solar energy fields, solar energy farms, solar energy products, and solar alternative energy projects in general can receive support for their FSE Listings from the Green Investors that are plentiful in Frankfurt. Once the firm is public and has the solar energy companies stock, and is a public solar energy company, the roadshow and financing documents can assist to take the company to the successful means of getting the solar financing they require. In addition, there are opportunities to finance with Carbon credits. Call us to discuss in more detail. 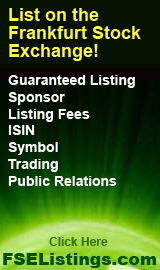 If you do not already have as website (which is a condition of becoming a publicly listed company on the Frankfurt Stock Exchange) we can also assist in building a solar energy website that best enables you to raise capital and present your firm to the exchange. Regardless of the popularity of the solar industry, solar energy education is one of the key factors that will assist in having investors put capital into your solar energy resource company over another alternative energy resource. You may read many solar energy articles online and many financing articles, but you will not find a firm that knows as much about listing and financing your solar energy company as ours. This entry was posted on Wednesday, April 27th, 2011 at 6:29 am	and is filed under Uncategorized. You can follow any responses to this entry through the RSS 2.0 feed. Both comments and pings are currently closed.